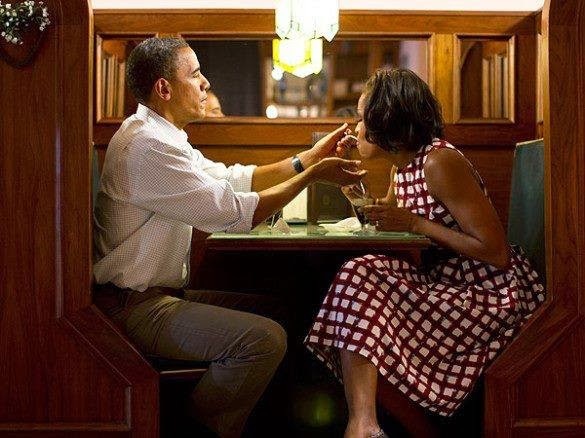 One Night President Obama and his wife Michelle decided to do something out of routine and go for a casual dinner at a restaurant that wasn't too luxurious. When they were seated, the owner of the restaurant asked the President's secret service if he could please speak to the First Lady in private. “Why was he so interested in talking to you. ?” , President Obama curiously asked his wife. She informed the Husband that in her teenage years, the man had been madly in love with her. Dear fan, believe it or not, sometimes its a woman that makes a man who he is..
[photos] Barack Obama flirting with the Danish Prime Minister at Nelson Mandela's ceremony. Michelle shuts it down. Barack Obama flirting with the Danish Prime Minister at Nelson Mandela's ceremony. Michelle shuts it down. Nelson Mandela, the revered statesman who emerged from prison after 27 years to lead South Africa out of decades of apartheid, has died, South African President Jacob Zuma announced late Thursday. Mandela was 95. "What made Nelson Mandela great was precisely what made him human," the president said in his late-night address. "We saw in him what we seek in ourselves." Mandela will have a state funeral. Zuma ordered all flags in the nation to be flown at half-staff from Friday through that funeral. Mandela, a former president, battled health issues in recent months, including a recurring lung infection that led to numerous hospitalizations. With advancing age and bouts of illness, Mandela retreated to a quiet life at his boyhood home in the nation's Eastern Cape Province, where he said he was most at peace. Despite rare public appearances, he held a special place in the consciousness of the nation and the world. In a nation healing from the scars of apartheid, Mandela became a moral compass. Look back at Mandela's early years 1990: Mandela released from prison 1994: Mandela takes oath of office His defiance of white minority rule and incarceration for fighting against segregation focused the world's attention on apartheid, the legalized racial segregation enforced by the South African government until 1994. In his lifetime, he was a man of complexities. He went from a militant freedom fighter, to a prisoner, to a unifying figure, to an elder statesman. Years after his 1999 retirement from the presidency, Mandela was considered the ideal head of state. He became a yardstick for African leaders, who consistently fell short when measured against him. Warm, lanky and charismatic in his silk, earth-toned dashikis, he was quick to admit to his shortcomings, endearing him further in a culture in which leaders rarely do. Former South African President F.W. de Klerk, who was awarded the Nobel Peace Prize with Mandela in 1993 for transitioning the nation from a system of racial segregation, described their first meeting. "I had read, of course, everything I could read about him beforehand. I was well-briefed," he said last year. "I was impressed, however, by how tall he was. By the ramrod straightness of his stature, and realized that this is a very special man. He had an aura around him. He's truly a very dignified and a very admirable person." For many South Africans, he was simply Madiba, his traditional clan name. Others affectionately called him Tata, the Xhosa word for father.